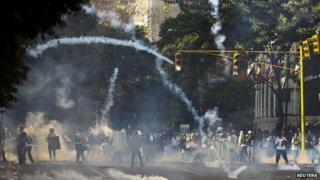 Thousands of Venezuelan students and opposition supporters have joined an anti-government rally in the capital, Caracas. The opposition criticised the heavy security operation put in place by the government to prevent the march from reaching the food ministry. "All this military deployment demonstrates the huge fear Nicolas [Maduro] and his government have to the protests against the serious problems faced by Venezuelans," Mr Capriles said. "They are destroying this country and people have the right to say that. It's not possible to criminalise social unrest." The government said it wanted to contain the march because it "had not been authorised". President Maduro has repeatedly invited all parties to take part in a "dialogue for peace". But during Saturday's rally, leaders demanded the release of detained students and the suspension of the "repression of the people" before any participation. Mr Capriles spoke to thousands of women, students and opposition supporters at the "March of the Empty Pot", that coincided with the International Women's Day. "Let's transform this protest into the greatest social movement in this country's history," Mr Capriles told the crowd, many banging empty pots as a symbol of the food shortages. "Don't go out to protest at night. That's when the paramilitary groups take to the streets to promote violence," he said. Since 12 February, at least 21 people have died in protests, Venezuela's ombudswoman, Gabriela Ramirez, confirmed on Saturday. Speaking to reporters in Caracas, Mrs Ramirez said that members of the security forces were suspects in four cases, 10 allegedly died at street barricades and another five in violent episodes near roadblocks. The opposition says tens of students have suffered torture since the start of the protests. The current wave of protests was initially started by disgruntled students in the western states of Tachira and Merida, but quickly spread to other areas.